October 7, 2010, K-Bomb Centcom, Los Angeles, CA—In what is arguably a drag-strip journalism first, both Cole Coonce’s Top Fuel Wormhole (his collection of drag racing essays), and its predecessor, Infinity Over Zero (an impressionistic history of the Land Speed Record), have both gone electric. Which is to say these may or may not be the first books on the topics to have a presence on Amazon.com’s Kindle store, but, arguably, these are the first essential ones. With new, paper-less versions of both of Coonce’s rocket-fueled books now specially formatted for e-readers, modern motor-sports esthetes can download these delicious digital documents and enjoy them with the knowledge that the trees spared by the lack of pulp-processing can now serve as emissions credits for burning rubber and fouling spark plugs. To that end, K-Bomb Publishing, the imprint that produced both the electric and paper versions of these thick tomes, encourages all consumers to brandish their Kindles at the drag races and, as the next pair of monopropellant-powered Funny Cars blasts by, exclaim to anybody who can hear over the noise that with enough pulp-free purchases of Top Fuel Wormhole, drag racing could ultimately be considered carbon neutral. Indeed, with an electronic acquisition of Top Fuel Wormhole, the drag-racing reader can enjoy Coonce’s exhaustive essays on San Fernando Raceway, Arley Langlo, Lions Drag Strip, “Wild Willie” Borsch, “Big Daddy” Don Garlits, Shirley Muldowney, “Jocko” Johnson, Blaine Johnson, the “Surfers,” Tony Pedregon, Mendy Fry, John Force and others, guilt-free! A similar, relaxed experience is available with the consumption of Infinity Over Zero, which recounts Andy Green’s smashing of both the Land Speed Record and the actual Sound Barrier in a jet-powered car, and explores the intrepid exploits of other fearless land-speed racers such as John Cobb, Mickey Thompson, Glen Leasher, Craig Breedlove, Art Arfons, Gary Gabelich and more. These thorough, stout books are available for wireless auto-delivery to one’s e-reader for the nice prices of $6.95 (Infinity) and $7.95 (Top Fuel Wormhole). And for old-school consumers, hard copies of both Wormhole and Infinity Over Zero can still be purchased, of course, at Amazon and elsewhere. But that’s hardly cool these day, is it? Future fodder for Volume 2 of Top Fuel Wormhole? 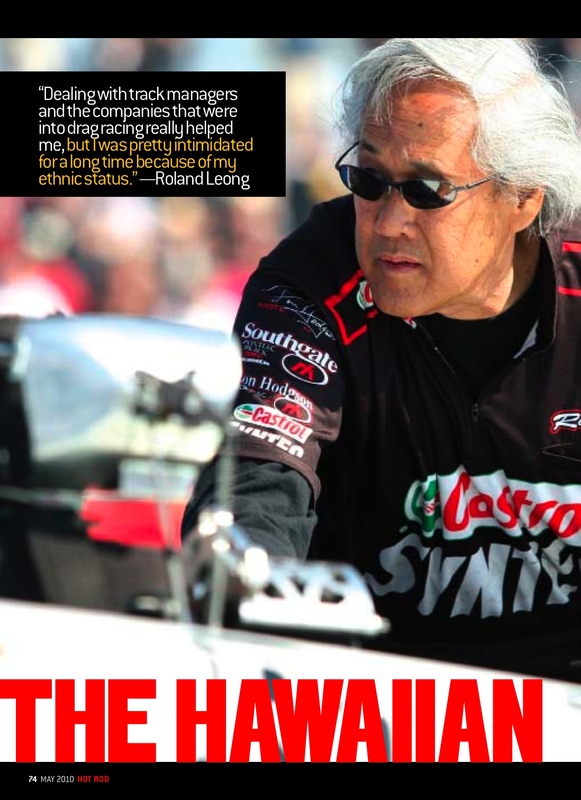 Catch the Roland Leong feature in this month’s HOT ROD Magazine. Out on better newsstands now! HOT ROD Magazine’s feature on octogenarian dragster-driver Chris Karamesines is now available both on the newsstand and online. Penned by author and drag strip journalist Cole Coonce, Karamesines rags-to-drag-strip-hero story is timeless — as is, apparently, “The Greek” himself, who, between rounds of competition in Top Fuel at last November’s NHRA Finals, blew out the candles on a birthday cake commemorating his eighty-one years on Planet Earth, packed his parachutes and then consented to his interview with Coonce, in which he looked back at his epic history. While retracing his sixty years of racing, Chris’s biographical retrospective included a thorough analysis of Karamesines’ provocative and debatable 1960 clocking of 204 mph in his Chizler AA/Fuel Dragster — an occurrence that has historians, bleachers bums and members of drag racing Fourth Estate still arguing amongst each other. Because of Karamesines apparent disregard for — if not subversion of — the dictates of time as we know it, his story seems like perfect fodder for a Second Volume of Top Fuel Wormhole. “We did it all, and we’ll never see times like these again.”—Dean Batchelor, The American Hot Rod. At first I thought it was a mirage. Or an apparition. I was suffering from an acute lack of sleep, my disorientation and sensory deprivation amplified by a lack of proper coffee as well as the blinding reflection of the morning sun as it bounced off of the milky-white, crystallized floor of the dry lakebed. I shook my head, threw back the dregs of the caffeine, and blinked. It was no hallucination. There I was at Edwards AFB, deep in the heart of the cruel and unforgiving Mojave Desert, a landscape that a French philosopher once called a “slow catastrophe,” and three paces from my bones was the man who organized hot rodding after WWII on this very same uninhabitable desert. That’s right: Wally Parks, President of the Southern California Timing Association in 1946. Editor of Petersen Publishing’s Hot Rod Magazinein 1948. President of the National Hot Rod Association during its birthin’ in 1951, until Dallas Gardner stepped in during the Reagan Years. And probably the first man to call the linear pursuit of horsepower a “drag race,” way back in 1939 in the Racing News. I was stunned and I was silent. I did not know how to approach the man. Or, closer to the heart of the matter, maybe I did not know how to approach the myth and the legend that is Wally Parks as he stood there larger-than-life, towering over the proceedings at the most mystical and legendary plot of real estate in these here United States of America. Ah yes, the mythology. There has been more history, folklore, and mythology concocted at the Muroc Dry Lake than anywhere else on the planet since the days of Apollo and Aphrodite making noise on Mt. Olympus. For it was at this wasteland where the Muroc Racing Association, predecessor to the SCTA, predecessor to the Russetta Timing Association, predecessor to the NHRA, etc., etc., etc., began in 1932, hosting competition between renegade hot rodders from the far side of the San Gabriel Mountains, men who would test their mettle, bravado and mechanical acumen by racing hari-kari across the lakebed, sometimes four or five abreast, kicking up such a furious tempest of dust and debris in their wake that only the leader of the pack could actually see where he was going. The other drivers? Well, crashing into your colleagues and barrel-rolling, hobbling into the nearest hospital in Palmdale, 30 miles away via an undulating washboard of a dirt road, only to find upon your return—assuming you survived—what was left of your race car had been scavenged and stripped down to the frame rails, that was the price one paid for inferior horsepower out there in the Mojave Desert during the years of Herbert Hoover and FDR. This, race fans, was the true genesis of drag racing. Is Top Fuel Wormhole an alternative NHRA history? Is Top Fuel Wormhole an alternative NHRA history? Could Steve Jobs save drag racing? Or is too late? 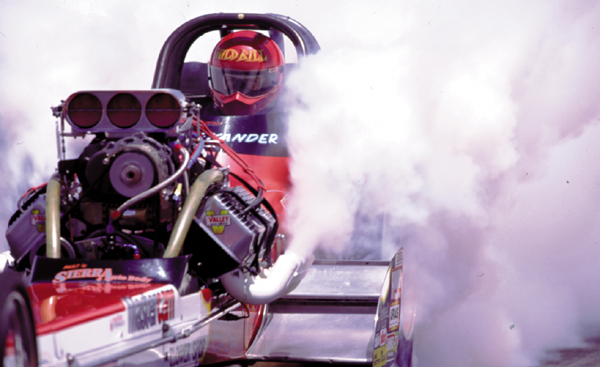 TalkRadioOne.com digs into the Top Fuel Wormhole with talk of Jocko Johnson, The Surfers, and “Wild Bill” Alexander — the outside, bizarre and death-defying figures who once defined drag racing….